Grassmarket is a boulevard that runs through Old Town, just below the castle. 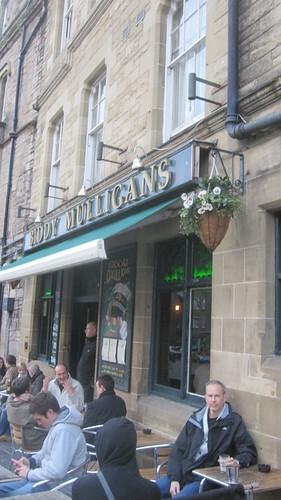 Biddy Mulligan's is the first of many pubs that line the north side of the street. An Irish pub, likely owned by Guinness itself, the beer lineup was weak. I ordered a half-pint of Guinness, and sat outside to enjoy the mid-day clouds, dampness, and breeze. But that's what people do in Edinburgh -- they sit outside, regardless. It's funny how hardy we Canadians think we are, but why do we abandon our patios the moment the temperature dips below 20C? Sitting outside in Grassmarket is a treat. It is a great place to people watch, as all walks of life are represented. Especially prevalent are the large groups of people out for a fun time on the town, all dressed the same, whether it be a themed hen party, or the mates in their untucked fitted dress shirts out to watch the rugby.